Stockholm Arena will give our capital city a positive lift in many ways. In terms of both sport and entertainment. But the 20,000 concrete sections that have to be fitted in place demand full control at all times. Roger Hansson has just that. There are great visions for the possibilities the 30,000 seat Stockholm Arena can create. As well as being the new home ground for at least one of Stockholm’s football teams, it will also make Stockholm a world-class event venue. Located a stone’s throw south of Globen, the new arena will be the venue for everything from big concerts and exhibitions to international football, equestrian sport and motor sport. Havator Montage is responsible for assembling the concrete frame of Stockholm Arena, in what is the company’s biggest ever project. 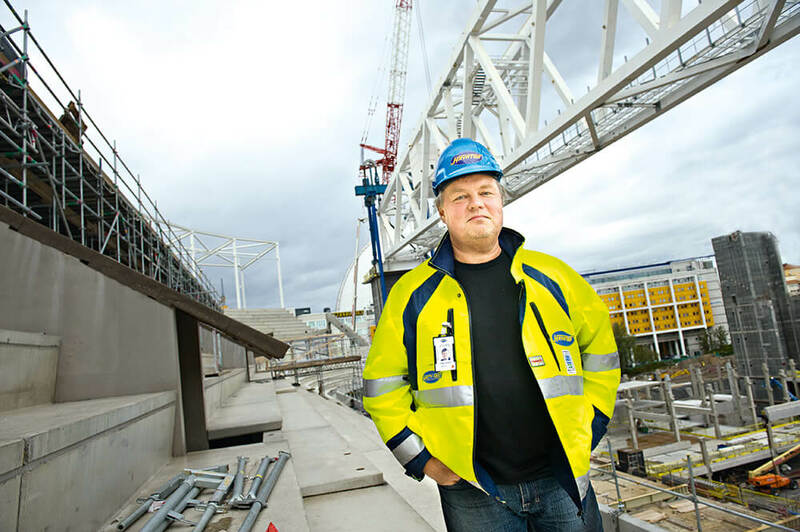 The client is the concrete framework constructor Betongmästarna i Sverige and the arena is to be ready for the start of the 2013 football season. Naturally the 20,000 concrete sections that are to be fitted need meticulous planning and follow-up, and for this task Havator is being aided by Elecosoft´s Plancon and Sitecon software. And the Elecosoft connection doesn’t stop there. Because it is former Elecosoft man Roger Hansson who has the main responsibility for planning and follow-up concrete assembly. “Havator has real experts in concrete assembly. My role is to handle contact with our client and to manage the planning and documentation of the project. You could say it’s like building an enormous Lego and Havator is the first to get started in this project. Roger Hanson joined Havator from Elecosoft last year, stepping back into the industry where he originally began his career. “Perhaps the greatest benefit of being a builder is that we can go past buildings that were erected perhaps 15 years ago, with a positive feeling that we have been part of creating something good.” As an old customer coach at Elecosoft, Roger naturally already knows all about the software. “The program works very well for us. All the planning is done in Plancon and just as important is the financial follow-up that we do with alteration and addition management in Sitecon. For a project as big as this one, that is obviously absolutely essential for success. For Havator, Stockholm Arena is a pilot project in Plancon and Sitecon, the idea being to gradually go over to using these programs in the rest of the organisation,” explains Roger Hansson.